When one hears the phrase ‘career in law’, their imagination takes a leap and conjures up the image of fiery orators dressed in jet black robes, furiously arguing their cases and ruthlessly dismantling the statements of their opponents. One second of imagining this and the next second, many strike down law as a career considering it too demanding or challenging. The Bachelor of Laws (abbreviated LL. B., LL.B., LLB) is the most popular degree in law offered in most countries. Client representation- As advocates, they represent one of the parties in criminal and civil trials by presenting evidence and arguing in court to support their client. As advisors, lawyers counsel their clients about their legal rights and obligations and suggest particular courses of action in business and personal matters. Whether acting as an advocate or an advisor, all attorneys research the intent of laws and judicial decisions and apply the law to the specific circumstances faced by their clients. Backend preparation before trial- Although all lawyers are licensed to represent parties in court, some appear in court more frequently than others. Trial lawyers spend the majority of their time outside the courtroom, conducting research, interviewing clients and witnesses, and handling other details in preparation for a trial. Law specializations and related activities- Lawyers may specialise in a number of areas, such as bankruptcy, probate, international, elder, or environmental law. Those specializing in, for example, environmental law may represent interest groups, waste disposal companies, or construction firms in their dealings with the U.S. Environmental Protection Agency and other Federal and State agencies. Protecting client’s interests- Some lawyers specialise in the growing field of intellectual property, helping to protect clients’ claims to copyrights, artwork under contract, product designs, and computer programmes. A degree in law, quite contrary to the general perception, offers a number of career options which are not directly related to the legal profession. Following are some career options one can pursue with a degree in law. There are many famous people who had studied law and went into different professions. In politics, no one can forget Mahatma Gandhi and Nelson Mandela for their efforts in gaining freedom and equality for their people. Famous TV producer John Cleese, prominent writer and commentator Ben Stein and even the celebrated Indian reformer and the chairman of India’s constitution drafting committee Dr. B.R. Ambedkar were all lawyers. In fact, Dr. Ambedkar has served as the principal of the Government law college which is not only one of the top law colleges in Mumbai but is also the oldest law college in India. No matter which career law students choose and whichever profession they go in, their legal credentials will always make them stand out in the crowd because of the skills they have gained by studying law. The study’s usability has found new fields to branch out into. Therefore, it does not come as a surprise that a huge number of successful people started their careers with a degree in law. And the trend still continues. Most of the law graduates prefer to work as a lawyer in reputed sectors. For this they need license issued by Local/ State/ Central BAR Council. They can begin their career in government sectors as lawyer in tax and labour departments, public prosecutors or in defence. The experienced ones can move up to the positions like Associate Attorney, Attorney, and Solicitor General etc. They can also join the teaching field, work for particular firms, organisations or family, in consulting agencies and even in political field. Salaries of experienced attorneys vary widely according to the type, size, and location of their employer. A qualified lawyer employed in the government department has pay packages as per the terms and conditions of the government. Those appointed as judges have good remunerations and other perks offered by the government. Lawyers preferring private sector have more lucrative pay packages. The earnings of lawyers working privately as advocate or consultant depends upon the number and nature of their clients. Numerous employment opportunities to choose from- With numerous employment opportunities in both the public and in private sectors, a career in Law is a lucrative option for many. 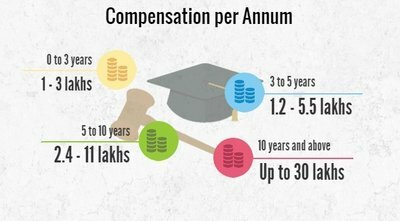 High salaries- With the emerging markets both in India and outside, lawyers get paid competitive salaries when compared to other industries. Develop better sense of judgment- Since the study of law covers every facet of life, it introduces and encourages learning about non-law subjects like business, sciences and even liberal arts. High stress quotient- Besides appearing in the court rooms on behalf of their clients, lawyers are also involved in the backend preparations. This can be exhausting and stressful. Long work hours- With good pay comes long work hours and tiring schedules. Irrespective of the industry that lawyers work in, they have to put in long hours of work.